Horn� Bezděkov, Czech Republic � On June 16 and 17, 2018, the best adventure minigolfers from around the world came to the Adventure Golf Horn� Bezděkov � course �Za Scrubem� to participate in the 2018 World Adventure Golf Masters (WAGM). 95 registered participants from 15 different countries competed over the two days, including many European countries and minigolfers from as far away as Australia, New Zealand, Ghana and the United States. All players played 6 rounds to determine the team winner as well as the winners in the Junior; Senior Male; Senior woman; Woman and Male categories. A final round was played for the top 18 players after the 6 rounds to determine the overall winner. It was a very close tournament as players who made the cut only shot a combined 14 rounds at par (36) or over through out the 7 rounds they played. The low score of the tournament would be a 27 by Martin Stockle. In that final round, only one stroke separated the top 3 players who were grouped together: Daniel Moser from Switzerland, Daniel Vlcek from the Czech Republic and Martin Stockle from Germany. Moser would play a fabulous final round shooting a 29, including an ace on the final hole, to seal the overall victory by two strokes. He would shoot an average of 31.57 over the 7 rounds. In addition to being crowned the best adventure minigolfer in the world, this year also features a partnership with the Major Series of Putting (MSOP) where the individual with the lowest score in WAGM will get a $1,000 entry into the Turbo Singles Championship at this year�s MSOP Championships in Las Vegas. Daniel Moser not only took away the gold medal and trophy, but also entry to the MSOP event in Las Vegas, later in the year. Jitka Vlckova, host and organiser of this year's WAGM said, "We were honored to organize such event as WAGM 2018. Our main goal was to provide a joyful week and unforgettable tournament to all the players, visitors and everyone coming to our course. Based on the feedback we�re getting, we think the goal�s been reached. On behalf of the whole team, I�d like to thank all the players for the great positive vibes they were spreading around, their discipline, respect and kindness during the whole time being here. It was our great pleasure to cooperate with everyone involved." When asked about the WAGM 2018, WMF Sport Director Pasi Aho said, "World Adventure Golf Masters 2018 was a great success. For the first time the event took place in Czech Republic and the organisation team have done a fantastic job to give us the best conditions. 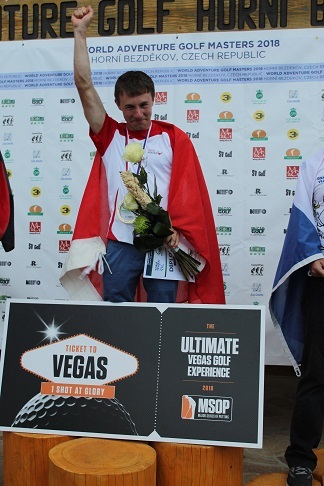 The level of play was very high and the performance of the home team was the little extra to make this event unforgettable for Czech minigolf. We also got new countries to the medal winners' list with, for example, Slovakia taking their first ever medal on world level. All in all I am very happy with the WAGM 2018 week."